As you may well know following this blog, my current research explores anthropomorphized virtual agent (AVA) technologies, in other words computer programs and interfaces designed with human features, characteristics and traits. These technologies are increasingly integrated into customer service platforms, information retrieval tools, and organizational strategies for personal computer and mobile technologies. I was just turned on to “Libby”, the new AVA designed by Airus Media for use as a virtual airport customer service assistant. “She” is currently installed at Newark Liberty International Airport though, according to the vendor aiportONE.com, other hologram assistants have been installed at LaGuardia and John F. Kennedy International Airports. It is hard to miss the blatantly gendered construction of Libby as the perfect service worker: she is passive, polite, does not speak unless spoken to, and only reaches for preprogrammed (preapproved) messaging. This video promotion for the AVA technology goes even further, first appealing to the audience by saying, “I look pretty good, don’t I?” then later coyly claiming, “I am so versatile- I can be used for just about everything.” The sexual undertones here aren’t accidental, indeed they are central to configuring the perfect female servant whose labor is inextricably tied to her value as a sexual object. 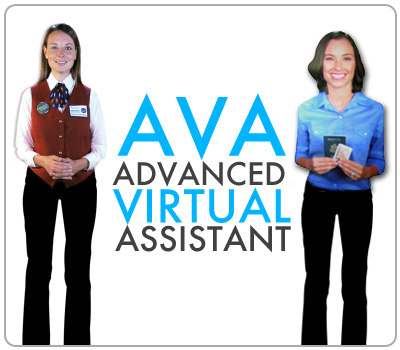 The virtual female worker is cast as tireless, efficient, and cheerful- all justifications that have been historically used to justify division of labor. The promotional video (and the other media briefs) outline a cheerfully delivered anti-labor position. AVA chirps, “I never take a break, don’t charge overtime, hardly ever take sick leave, and I don’t need a back ground check!” The description provided claims, “She says what you want, the way you want it said and never takes a break.” In this statement the fantasy of the perfect female worker is completely wrapped in notions of male dominance and female compliance. As real women struggle for equality in the labor force in terms of pay, opportunities, and respect, a new labor force is being designed into being that draws heavily on negative stereotypes of women. Even more concerning are the ways these digital workers are being pitted against real women in a contest for the perfect service worker. It is imperative that we ask questions about the anthropomorphized design strategy- what are the cultural meanings of these representations, and who do they serve?